Opis: The small core of elliptical galaxy M87 appears to be energizing its whole galactic neighborhood. 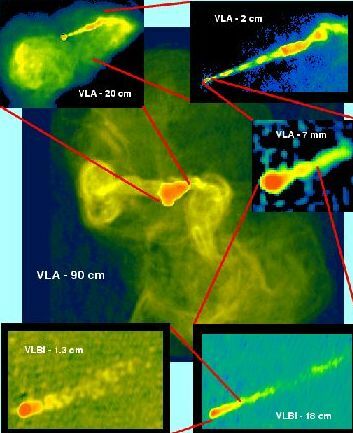 Recent images from the Very Large Array (VLA) of radio telescopes indicate that huge bubbles of hot gas not only exist but are still being created. These bubbles measure 200,000 light-years across and surround the entire galaxy. The source creating and feeding the bubbles has been traced to jets pointing back to M87's center, where a supermassive black hole is thought to live. The smallest scale on the above radio-map is 0.2 light-years and imaged by many radio telescopes working together (VLBI). The labeled numbers refer to the wavelength of the radio waves observed. The exact composition of these jets is not known, but thought to contain various subatomic particles.